Over the past year Muzafar, Khadim, Tahira, Nagina, Khalil, Halima and the teachers and students at the CRLC have presented The Staging Post at many schools and universities. In 2018 we’d like to hold more events like this. I was looking at the two photos below and realised they represent everything I hope for the film in Australia; for other Australians to ‘meet a refugee’. 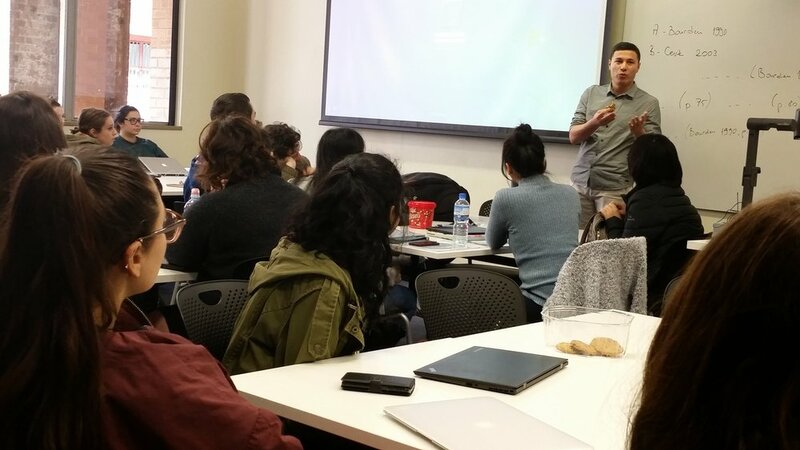 On the left is a photo from a screening at Holroyd High School, a Western Suburbs Sydney public school with 40-50% refugee-background students. On the right is from a screening at AschamSchool, an expensive and prestigious private school for girls in Sydney’s Eastern Suburbs. At Holroyd we watched the film sitting on the basketball court but the story was so close to their own experience they couldn’t look away. When Muzafar spoke afterwards the room was silent, even the teachers were hanging on every word. He was an instant hero to the kids as he told them; they were the leaders of tomorrow. That they were the one’s who could do something. It gave me chills. At Ascham School, 600 privileged girls, our biggest audience yet, also watched the film in silence. When Muzafar walked on stage afterwards they stood and gave him a 3 minute standing ovation. Our most enthusiastic reaction yet! What did he tell them? That they were the leaders of tomorrow and that they were the ones who could do something of course! We would love to repeat the screenings at schools and universities all around the country. We have plenty of ideas for fun, engaging workshops that involve lots of interaction between the kids in Indonesia and those here. Please get in touch! The journey continues. Thanks to the Australian Education Union Victoria there's a study Guide too, Find it here.